Finally the rain has stopped and the temperature is warming some. There’s not much more than 20 degrees difference between the high and low temperatures the last couple of weeks and hopefully that will continue. In Italy, Spring means vegetables. Primizie – first of the season. Around Lazio there are so many spring vegetables, many of them, most Americans have never experienced. The Italian way is to eat as much as you can of the produce as it comes into season and then it’s gone. Prepared as simply as possible, often with nothing more than olive oil and a few spices. Most Italians, at least those over the age of 25, are foragers. No matter where you drive in the springtime you’ll see cars parked alongside the roads and there will be people hunting for the delicacies found in the fields everywhere. Whether it’s for wild asparagus, punarelli or another chicory or other wild greens, like biete or insalata campagnolo. There are 50 different varieties of artichoke grown in Italy, but the romanesco variety is the most popular and has gained the EU designation of origin for produce, IGP. presentation of artichokes. I plan on getting there this year on my next trip. Ah and the fava beans. May 1st is a traditional day to have fava beans and they are at all the open air markets and along side the roads in trucks. Mostly they are bought and put on the table in bowls with a dish of Pecorino alongside. You sit around the table and split the long beans open and pop the beans out, eating them with the Pecforino. I believe the first time I had them like this was at our Italian family’s home on a Sunday. They must have been 12 inches long, bright green and quite plump. She plopped the hunk of Pecorino down and said “Mangia”. And we did! I’d never seen or heard of puntarelle before moving to Italy. May brings these cute little green curls into the markets. Usually they are in a bucket of ice water. They are tender and usually served fresh with just a little lemon juice and olive oil or an anchovy vinaigrette. Fragile, fresh and delightful. The perfect recipe for spring is vignarola. There are versions from almost every region, but I like the Roman Vignarola. Try this recipe. Fill a large bowl halfway with cold water. Squeeze the lemons into the water and add the rinds to the bowl. Using a serrated knife, cut off the top third of an artichoke. Pull back and snap off the dark green, leafy blades, one by one, until only the pale yellow leaves remain. 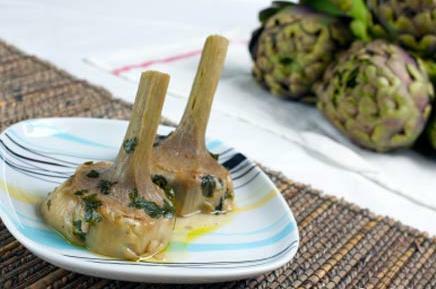 Using a paring knife, trim the artichoke bottom and stem to the pale green flesh, then cut it in half lengthwise. Drop into the water (that keeps them from turning brown) and repeat with the remaining artichokes. Using a spoon, scoop out the prickly leaves and hairy choke. Cut each half into 4 wedges and return to the water until ready to use. If using fresh fava beans, bring a large pot of water to a boil. Fill a large bowl two-thirds full with ice water. When the water comes to a boil, add the beans and cook for 1 minute, tjen drain and immediately submerge the beans in the ice water. Peel the beans by gently tearing the pale skins and pinching at one end (it’s really easy). Discard the skins, reserving the dark green interior bean. To cook the ragout: Heat a 12 inch non reactive pan over medium heat. Add 1/4 cup olive oil and when hot, add the onion, oregano and guanciale (or pancetta). Cook, stirring occasionally until the onion and pancetta are translucent, about 10 minutes. Drain artichokes and add to the pan, along with 2 cups water and 1-1/4 teaspoons salt. Bring the liquid to a boil, then reduce heat to a simmer and cook until artichokes are just tender, about 25 minutes. If using frozen favas, add them and cook for 2 minutes. If using fresh favas or frozen edamame, add them, along with the peas and cook until warm and tender, about 5 minutes more. Remove the oregano sprig. Sprinkle in parsley and mint. Season with lemon juice, fresh ground black pepper and if desired, additional salt. Drizzle with extra-virgin olive oil and serve. It’s really wonderful and makes you feel like life is starting over all fresh and new. My next trip is approaching. I will be in Italy most of the month of April. Shopping for requested items as well as bringing back some really lovely little items for all of you. If you want anything specific, let me know by email. I’m excited to be in Italy again. This trip will take me to Umbria, Tuscany and Lazio. A presto e avere una fame da lupo (I’ll be back soon, stay hungry as a wolf). 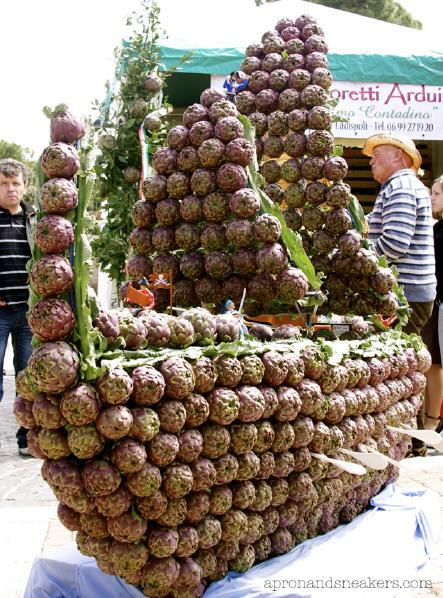 I had no idea there are over 50 varieties of artichokes in Italy! I especially enjoy the Jewish artichokes that are fried and served in the Jewish Ghetto in Trastevere. I’m really looking forward to those carciofi alla giudia and alla romana. This will be my first time there when the Ladispoli sagra is happening, so I’m hoping to get some great photos to post.